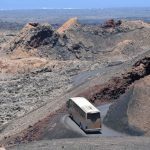 On the island of volcanoes surprises do not stop appearing before the eyes of visitors. One of the emblematic landscapes is La Geria, the wine region that intrigues and astonishes those who have it before their eyes. 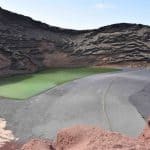 Today we present what you should know about Lanzarote wines. Meet with First Minute Transfer why they are so special and what is behind their production process. 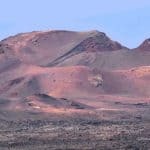 Talking about the wines of Lanzarote requires referring to La Geria, the island’s wine region par excellence. A landscape dominated by vines that grow in large holes dug in volcanic ash. These, in turn, are surrounded by stone walls that protect them from the wind. It is a very particular sight that some compare with a lunar landscape. A few centuries ago the view was different, the whole area of La Geria was composed of fertile land. But volcanic eruptions that occurred between 1730 and 1736 covered it with ashes. So the peasants of the time had to manage to cultivate. And then they devised this hole system to reach the fertile land. Contrary to what one might think, ash does not hinder them but has become their ally. Thanks to this element, together with the climate and other peculiarities of the area, Lanzarote wines make what they are today. This volcanic ash helps protect the vines, preventing soil erosion and conserving moisture. But then there was another problem, the winds coming from Africa. For this the peasants also found a solution. They minimized their effect on crops by placing stone walls in the shape of a half moon. That is the landscape that captures the visitors of La Geria, an area classified as a Protected Natural Landscape. However, this is not the only wine region of Lanzarote. Throughout its seven municipalities there are around 2000 hectares of vineyards in which wines with Designation of Origin are produced. The flavor of Lanzarote wines is very particular and of great quality. All this thanks to the particular conditions of the soil and the climate of the island. 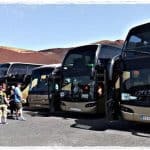 If you visit Lanzarote you can not stop making the route of the wines and taste them accompanying the typical meals, with which they make a perfect marriage. High acidity, due to the soil. Level of sugars and high alcohol, thanks to the temperature of the soil. Mostly white wines are made, but reds and pinks are also of excellent quality. The varieties that are cultivated are malvasía, diego, white and black, vijariego, negramoll, muscatel and burrablanca. Among these we must highlight the volcanic malvasia, a unique variety in the world. And it is the one that is best adapted to the conditions of the island. Malvasia has a good structure, it is small and very aromatic. It has little performance, but can be put in barrels. In addition, this is the most famous white wine of the Canary Islands. The quality of these products led to the creation of the Wine Denomination of Lanzarote in 1993. Those who receive this designation are guaranteed to be unique and of excellent quality. On the island there are numerous wineries, of which 18 are attached to the Regulatory Council. This is the one in charge of guaranteeing the wines of the Denomination of Origin Lanzarote. Each winery seeks to produce complex wines of better quality, without leaving aside traditional processes. In the middle of the month of August the Harvest Festival is celebrated, although the harvest of the grapes extends from July to October. In fact, it is the first one in Europe. The party full of color and music to the island. And during the celebrations it is shown how the grape is collected, which under these conditions must be done manually. Visitors have the opportunity to see the whole process. In addition to participating in traditional production if they wish. 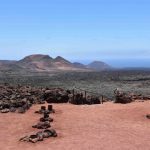 Showing how the first peasants worked is a source of pride for Lanzarote. They take advantage of the holidays to walk the children on camels, an animal that supported the work of farmers during the eighteenth century. Each variety of grape has a different ripening period. Therefore the collection is done at different times. The Malvasia is the first to be ready and the one that is collected before to produce the best wines of Lanzarote. While Muscat and Diego are the last to be collected. 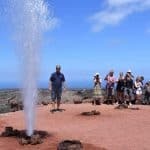 You can start to organize your trip and plan the excursions in Lanzarote from this moment. 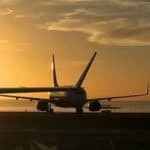 This way you have the guarantee of getting a privileged place during the holidays and attending the festivals on those dates. But if you go in a different time to the vintage there is no problem. 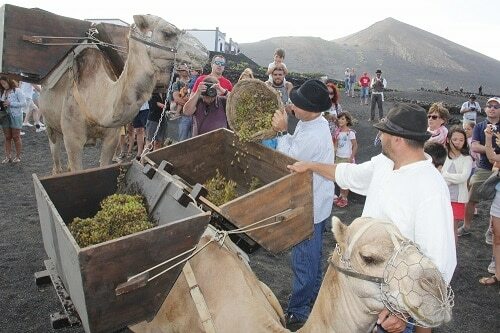 At any time of the year you can visit the wineries and visit the wine route in Lanzarote. For this you only have to check the schedules and make sure you are on time. The wineries of La Geria and Rubicón are two of those that you can not miss. The first was built in the 19th century. The advantage is that they are facing each other. In addition, they are the center of the Harvest Festival. 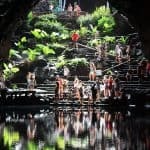 Another one you should visit is El Grifo. It is the oldest winery in all the Canary Islands. There you can learn details of the history of wine production in Lanzarote because it is where the museum is. 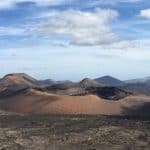 This is what you should know about Lanzarote wines. If you are ready to organize your trip, contact us. 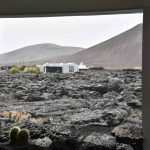 Previous Previous post: Lanzarote as a couple – What to do?